My investments for week 33 included FLO, SDIV, PEP, SBUX, TGT, UL, WMT, and AMZN. The yield this week was 4.18% compared to 2.82% the week prior. The yield is much higher this week as I made large investments in TGT, SDIV, and FLO, which all pay dividends. 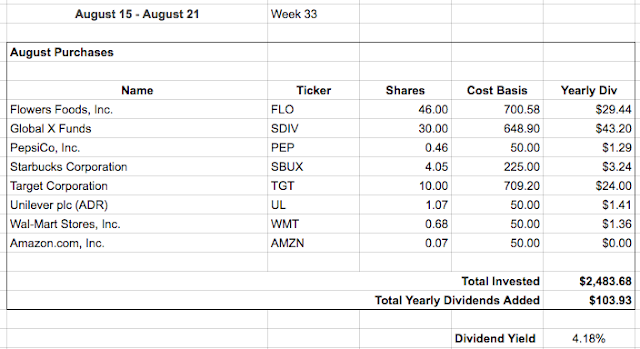 The amount of yearly dividends added ($103.93) was higher than last week ($15.70) as all but one of my investments this week went into dividend paying stocks except for Amazon. 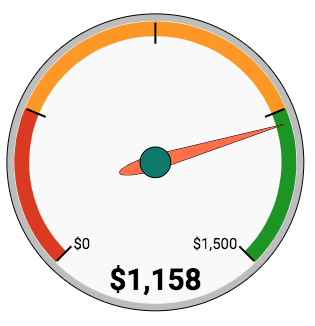 Also, I deployed over $2,000 this week pushing up the yearly dividends. Amazon was the only non dividend stock I invested in and it was a very small portion of this weeks investments. I finally put to work some of the extra money I had as FLO and TGT were being dragged down for reasons I do not think will hamper them in the future. This marks 33 consecutive weeks without paying commissions! Have you also invested in FLO and TGT recently? Why or why not? Even ii bought FLO,tgt and WMT in last 10 days. Good to see you are buying similar companies. These are some great companies with a solid history of dividends! I've been all in on FLO this month (slow industry, bread never goes out of style, decent DGR, 4% yield, don't see the headwinds as long term), might pick up some TGT as well this week. Thanks for stopping by seems like many of us have been picking up FLO recently. It is definitely one of the higher yielding companies in my portfolio so I am glad to add it. Target is one I have been watching for a long time, and figured it was a good time to get in. Although like I said in the long run it won't make much of a difference. Glad to now be a shareholder! I also invested in TGT recently after that 6% pullback. I also like some of the other companies you purchased such as PEP, WMT, and UL. Thanks for sharing. Exactly what I did! I hope to make PEP WMT and UL some of my biggest holdings. Thanks for stopping by! I bought 200 shares of FLO, then I got 100 more shares on a Put that expired in the money. I haven't bought TGT yet, I sold a put the day before earnings and the stock dropped $4 a share. So I sold another put a few months out at $70 to try to save the trade. We'll see what happens. Worst case, I pay $70 a share for 100 shares of TGT. Awesome! That should add quite a bit of dividend income to your portfolio. Interesting about the puts - as it seems like some DGI investors are mentioning it more and more. I love both of these moves! Thanks very much! Look forward to it!